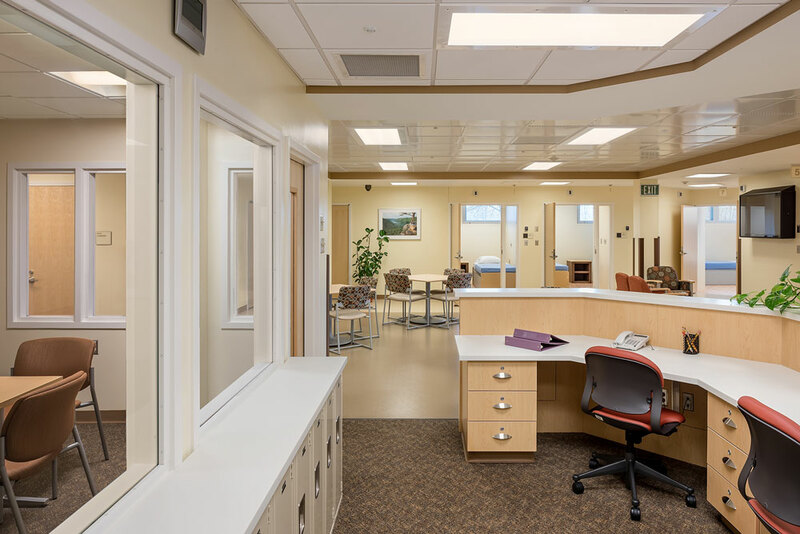 Designing a mental health facility requires special considerations to protect the safety and dignity of patients in a fragile psychiatric state, and ensure the security of staff. Previously, designs restricted freedom and created institutional atmospheres focused on safety, further stigmatizing patients. Today, we recognize that providing both safety and dignity are not only possible, but beneficial to the healing process. Natural light and the ability to view exterior environments has been shown to advance healing and recovery. Clerestory windows of shatterproof glass admit light and access to nature, but shield patients from passersby, with embedded shades for each patient’s control of their environment. Natural light is welcomed deeper into adjoining rooms via glazed openings. Making a space feel less institutional reduces anxiety and contributes to a comfortable, homelike impression. Thoughtful color and material choices including soft palettes of earthy beiges, blues, and greens and natural materials such as wood generate a calming, soothing effect. Soft seating with durable yet beautiful upholstery brings a residential feel while maintaining safety. Shatterproof acrylic and secure hardware allow visual elements while eliminating potential self-harm materials. The ability to control one’s social environment promotes positive socialization and engagement. A U-shaped nurse station open on both sides allows staff to react quickly during a crisis, but encourages positive socialization between patients and staff. The warm, inviting atmosphere appears as an intentional design feature, but provides staff protection from assaults and improves workflow. Interaction is further encouraged when patients have the flexibility to select the atmosphere best suited to their mood, from more secluded, private areas to larger, more social and open spaces. Trends indicate that choice of environment produces a more dignified patient experience. An inpatient stabilization unit (ISU) provides the opportunity to begin evaluation and treatment of arriving behavioral health patients immediately. Where possible, the patient’s condition is stabilized within the unit and the patient is released back into the community. If continued treatment is required, patients can be transitioned into a behavioral health unit within the hospital. An ISU offers a therapeutic environment for patients experiencing a behavioral health crisis, rather than just a safe holding environment typically found in emergency departments. Harriman incorporated best practices when designing a new admissions area and ISU. Patients are provided with a secure environment during admission, and a private and dignified experience throughout their treatment. Staff benefit from improvements in workflow and circulation as well as enhanced security. The ISU boasts an abundance of natural light, an open design, and a soothing ambiance. Integrating healing design features give us the opportunity to shape psychiatric healthcare by going beyond function and safety to include the dignity and respect all people deserve.